Barn-owls (family Tytonidae) are one of the two families of owls. 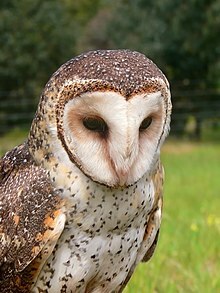 The other is the true owls, Strigidae. They are medium to large sized owls with large heads and heart-shaped faces. They have long, strong legs with powerful talons. The barn owls are a wide ranging family. They are not found in northern North America, Saharan Africa and large areas of Asia. They live in a wide range of habitats from deserts to forests, and from temperate latitudes to the tropics. The barn-owls' main characteristic is the heart-shaped facial disc, formed by stiff feathers. The feathers help to amplify and locate the source of sounds when the bird hunts. Adaptations to the wing feathers eliminate sound caused by flying. This helps both the owl's hearing, and keeps the prey unaware of the owl. To summarise: the owl hunts mainly at dusk and night-time. Its uses sound to detect prey movement: its hearing is sensitive, and its wings are almost silent. Fossil genera. The fossil record of the barn-owls goes back to the Eocene. Steadman, David William 2006. Extinction and biogeography of tropical Pacific island birds. University of Chicago Press. ISBN 0-226-77142-3. This page was last changed on 19 September 2018, at 10:33.